Machine Quilting Service Your quilts will be finished on an Innova quilting machine with Grand Format Embroidery. This gives us the opportunity to guarantee accuracy in every stitch! The Grand Format Embroidery field is 14 feet wide, so the only limit you have for adding embroidery and applique is your imagination! We also provide hand-guided techniques for custom work including micro-stippling, and other freehand designs. Your quilt top should be pressed flat, and all of the seams should be flat. There will be a bit of wrinkling during shipment, but the top will be lightly pressed again before quilting to ensure that it will look it's very best. All loose and stray threads should be clipped. Stray threads may show through on light colored fabrics. Keep top, batting and lining separate - there is no need for you to baste or pin your layers together. Each piece will be loaded on to the machine separately. The backing and batting should be a minimum of 12 inches wider and 12 inches longer than the quilt top. For example, if your quilt top is 60 inches square, then your backing and batting should be 72 inches square. If your quilt has one side that you consider to be the top, please indicate that with a marked piece of paper and attach with a safety pin. Also, if you have a definite direction for your backing, please mark that with the same method. If your backing looks the same on both sides, such as a sateen fabric, please mark which side you prefer to be on the outside. Please remove all selvages from the backing fabric - these will shrink, and cause problems later. It is helpful if you have enough fabric to use a 1/2 inch seam allowance if you need to piece the backing. Also, it's a good idea to have your seams running lengthwise, instead of widthwise, if it is possible for you to do so. We ask that you do not use bed sheets for backing. Sheets have a higher thread count, and this can cause skipped stitches and tension problems. Please click here to read the article about wavy borders, and what causes them. If you take a few precautions while adding borders to your quilt top, you will ensure a nicer finished product that will lay flat and not have puckered or wavy borders. All prices are calculated per square inch. Take the length of your quilt, and multiply it by the width. For example, if your quilt measures 89 inches by 74 inches, your quilt is 6,586 square inches. For the different pricing categories, see the categories below. For a quote on your quilting service, please contact Robin@CandyAppleQuilts.com or call 440-371-6409. You can get a basic idea of the cost by multiplying the number of square inches in your quilt top by the following category prices. First, you will need to choose a style of quilting that you will enjoy. You may want to read this article to help you choose a quilting style. Look at the samples below, and you will see a starting price for each category. This will give you an idea of the final cost, but does not include extra items that are available such as hand-binding, labels, embroidery.... and more. This is an over-all design, extending from top to bottom and side to side. This style has the same pattern thoughout the center section, but different border treatments. You can have as many border styles as you would like! Each block has a separate design, and the border areas feature a coordinating style to the blocks. If your quilt features applique or embroidery, you may want to have small stippling surrounding the areas to highlight your work. Also, if your borders are "piano key", you may want a special design in each key. Price will vary, call today for an estimate. 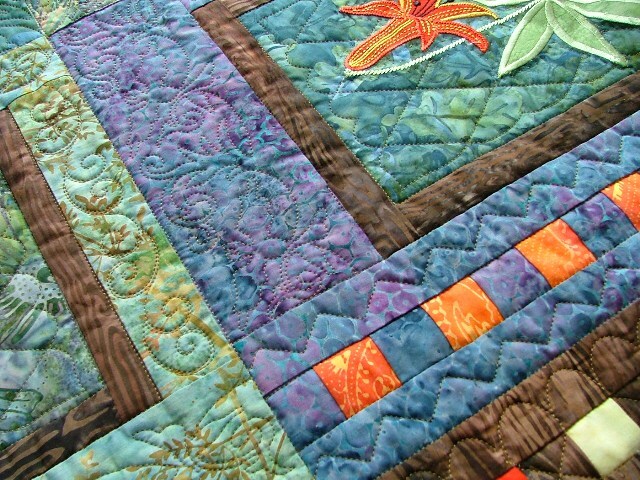 This style of quilting combines lots of stitch in the ditch, cross-hatching, outlining, and even hand-stitching! Wholecloth quilts are beautiful, and require very little work for you to prepare! Let the designs be the highlight on a beautiful sateen or suede! The last step in finishing a quilt is to add the binding. If this is a step that you don't enjoy, let us handle it for you! The first thing you need to know is how long your binding needs to be. Add the total measurement of all four sides of your quilt. Then, add eight inches to this calculation to allow for overlapping the ends to finish the final miter. Method one involves sending along your binding cut to size, folded, and starched. We will sew in on to the entire front of the quilt, trim away all excess batting and backing fabric, and create your corner miters for you. You can enjoy stitching the binding to the back of the quilt. Method two involves including sufficient fabric for us to create the binding for you. We do all of the cutting, piecing, ironing, starching, attaching ---- and even the hand stitches on the back! Your quilt is complete when it is returned to you! Custom Quilting Services Prices will vary depending on what type of quilting is done. For an interesting comparison between quilting prices from various companies, click here. "D" is Heirloom Quilting - this involves significant stitch in the ditch, micro-stippling, trimming away for applique pieces, scalloped borders, and begins at $0.6/Sq Inch. The best way to determine what the cost would be is to bring your quilt top (or email a picture) and discuss the details. Measurements will be taken, and you can preview many different quilting designs to plan the exact choices for your quilt. We have a Quilting Estimate Worksheet that is completed during the discussion. The worksheet includes details on quilting choices, thread choices, binding options, and all other extra services that are available for your choice. The estimate is completed, we both sign the worksheet and you get a copy. Estimates are good for 30 days. When you leave your quilt to be finished we finalize the worksheet, agree on the pricing and set a completion date. For out-of-town customers, the Quilting Estimate Worksheet will still be completed, but the discussion is on the phone or by email. Return shipping charges will be added to your Quilting Estimate Worksheet. All quilts ship via USPS Priority Mail, and you will be provided with a tracking number upon shipment. Insurance is available for an additional charge. Please note that once shipment is made, Candy Apple Quilts is not responsible for any loss of the package incurred during the shipping process. If you need to make a claim with the postal service, a receipt will be provided to you to help with the process. A 50% advance deposit is required before quilting begins, and we require payment in full when you pick up your quilt, or before it is shipped back to you. Sales tax applies to all purchases, services and products per Ohio state tax laws. We accept PayPal, checks, or cash. All prices are subject to change without notice. To make an appointment call 440-371-6409. Here is a handy chart to use in figuring out approximate quilt sizes. You may find a pattern that is just a little larger or smaller than these sizes, and you can decide if you would like to adjust the width of your borders to compensate for the difference, or maybe add or subtract blocks in your design. Click on the button below to download a complete PDF file. This is handy to print out and keep in your purse --- you never know when inspiration will strike! You have a bit of leeway in these measurements, but this will get you started. Don't worry if things don't match up perfectly, BUT .... one thing to keep in mind before you get started is shrinkage. If you are using 100% cotton fabrics, and not pre-washing, you may lose a few inches in each direction when the quilt is first laundered. That may be a good thing, or a bad thing, depending on your intentions. Click on the button below for a free complete PDF file!